What to do if you have a swarm. So, you went out today and found a swarm of bees on the tree in your yard. You’re worried because that looks like an awful lot of bees and you don’t want to get stung and you don’t want your children stung. That’s a reasonable response. So, what should you do? DON’T PANIC! Swarming bees are just looking for a new home. Since they don’t have a home or honey to defend, they are not really in the mood for stinging, unless you decide to disturb them first! DON’T get out the can of insecticide and spray them. Much of the food we eat depends on these little gals for pollination. DO give us a call! 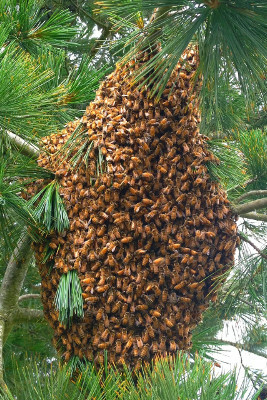 There are lots of beekeepers who would LOVE to come take this swarm off your hands. Most will even do it at no cost to you. Look below and you will find a list of direct phone numbers for those who collect swarms or call: 541-203-0117 and we’ll help find someone to help you out. If they do structural removals (cutouts), it will say, otherwise they only do normal swarm removals like in the photo on this page. What if you can’t find a beekeeper? Well, remember that your swarm is just a group of temporarily homeless bees. As soon as they find someplace to settle, they’ll leave. In the meantime, just leave them alone and maybe take a few minutes to marvel at these wonderful little creatures. For Yellow Jackets & Hornets, see the information below the swarm list. "Text OK" means you may contact them by text. In other parts of Oregon, check the Oregon State Beekeepers Association Swarm Call List. In other parts of the United States, contact your state beekeeping association. If you know for sure you have yellow jackets or hornets, please contact Dan Scollard at 541-753-6861. This free service safely removes yellow jacket and hornet nests and their occupants from your property. Their venom is necessary in the manufacture of lifesaving allergy shots. Your call is important and appreciated as your nest has the potential to save someones life. Turn your nuisance into your neighbor’s medicine! For more information check out Oregonwasp.com.